There are two types of central air conditioning systems: Direct Expansion (DX) type of central air condition plants and Chilled Water type of the central air conditioning plants. In the DX system the air used for cooling the room or space is directly passed over the cooling coil of the refrigeration plant. In case of the chilled water system the refrigeration system is used to first chill the water, which is then used to chill the air used for cooling the rooms or spaces. Both these systems have been discussed in details; this article discusses DX system, while the next one describes chilled water system. In the direct expansion or DX types of air central conditioning plants the air used for cooling space is directly chilled by the refrigerant in the cooling coil of the air handling unit. Since the air is cooled directly by the refrigerant the cooling efficiency of the DX plants is higher. However, it is not always feasible to carry the refrigerant piping to the large distances hence, direct expansion or the DX type of central air conditioning system is usually used for cooling the small buildings or the rooms on the single floor. The plant room comprises of the important parts of the refrigeration system, the compressor and the condenser. The compressor can be either semi-hermetically sealed or open type. The semi-hermetically sealed compressors are cooled by the air, which is blown by the fan, while open type compressor is water cooled. The open compressor can be driven directly by motor shaft by coupling or by the belt via pulley arrangement. 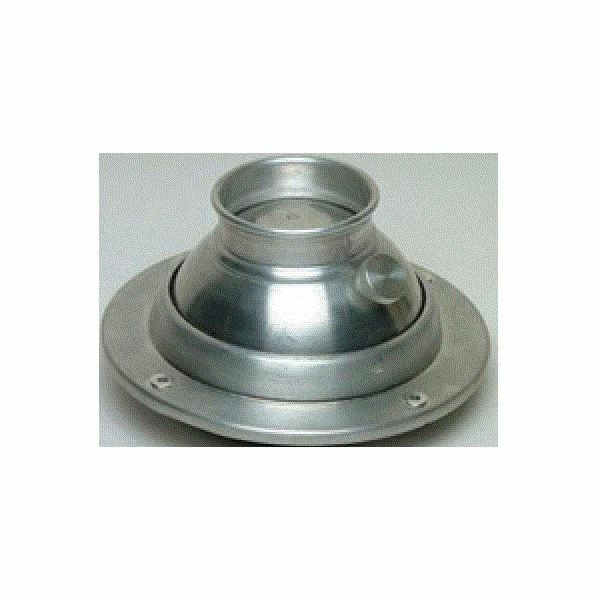 The condenser is of shell and tube type and is cooled by the water. The refrigerant flows along the tube side of the condenser and water along the shell side, which enables faster cooling of the refrigerant. 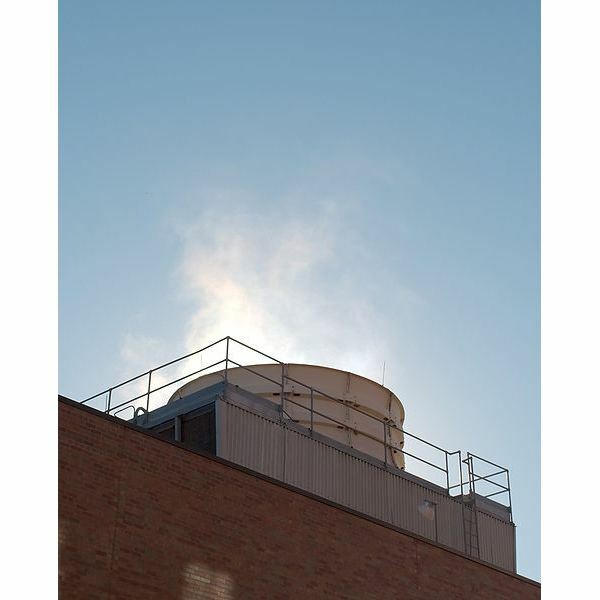 The water used for cooling the compressor and the condenser is cooled in the cooling tower kept at the top of the plant room, though it can be kept at other convenient location also. 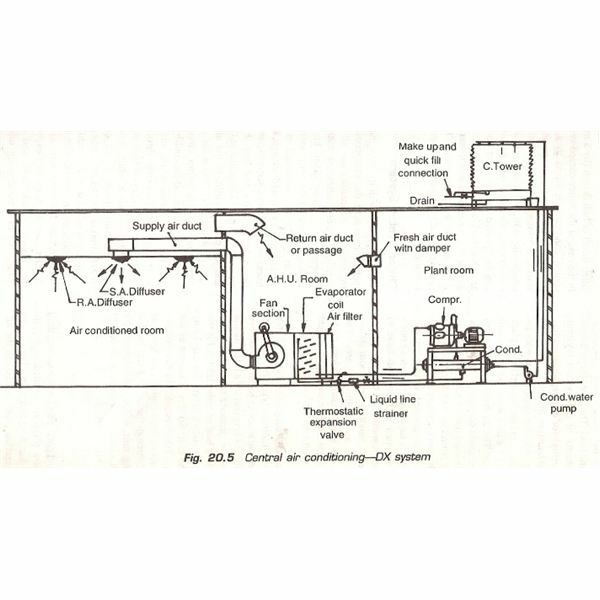 The refrigerant leaving the condenser in the plant room enters the thermostatic expansion valve and then the air handling unit, which is kept in the separate room. The air handling unit is a large box type of unit that comprises of the evaporator or the cooling coil, air filter and the large blower. After leaving the thermostatic expansion valve the refrigerant enters the cooling coil where it cools the air that enters the room to be air conditioned. 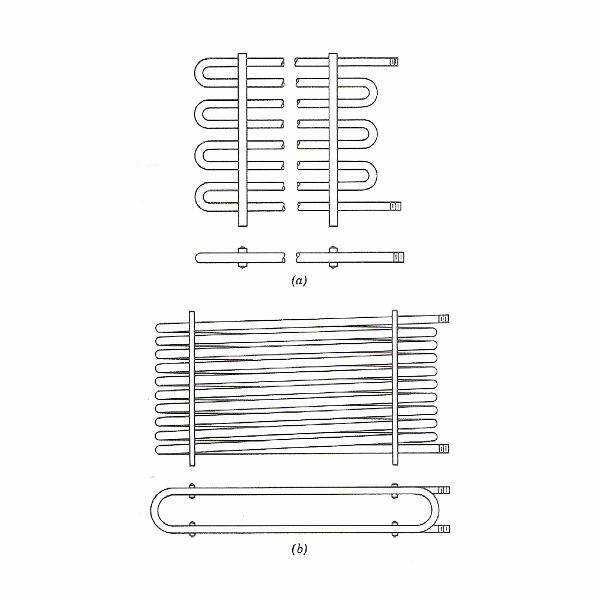 The evaporator in the air handling unit of the DX central air conditioning system is of coil type covered with the fins to increasing the heat transfer efficiency from the refrigerant to the air. There are two types of ducts connected to the air handling unit: for absorbing the hot return air from the rooms and for sending the chilled air to the rooms to be air conditioned. 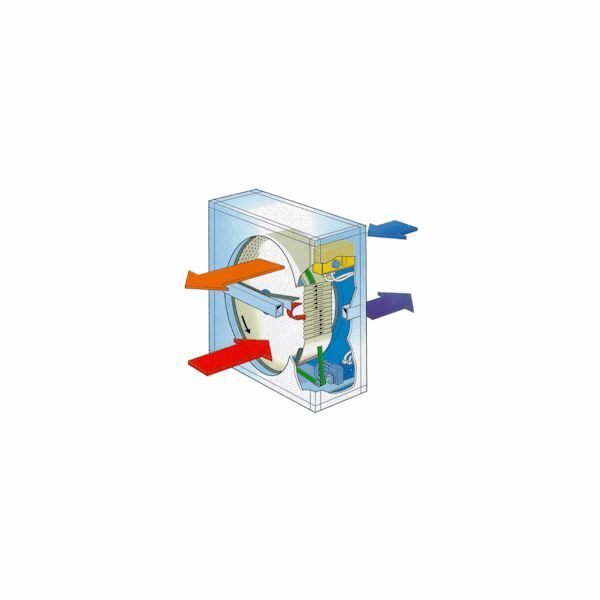 The blower of the air handling unit enables absorbing the hot return air that has absorbed the heat from the room via the ducts. This air is then passed through the filters and then over the cooling coil. The blower then passes the chilled air through ducts to the rooms that are to be air conditioned. This is the space that is to be actually cooled. It can be residential room, room of the hotel, part of the office or any other suitable application. The ducts from the air handling room are passed to all the rooms that are to be cooled. The ducts are connected to the grills or diffusers that supply the chilled air to the room. The air absorbs the heat and gets heated and it passes through another set of the grill and into the return air duct that ends into the air handling unit room. This air is then re-circulated by the air handling unit. 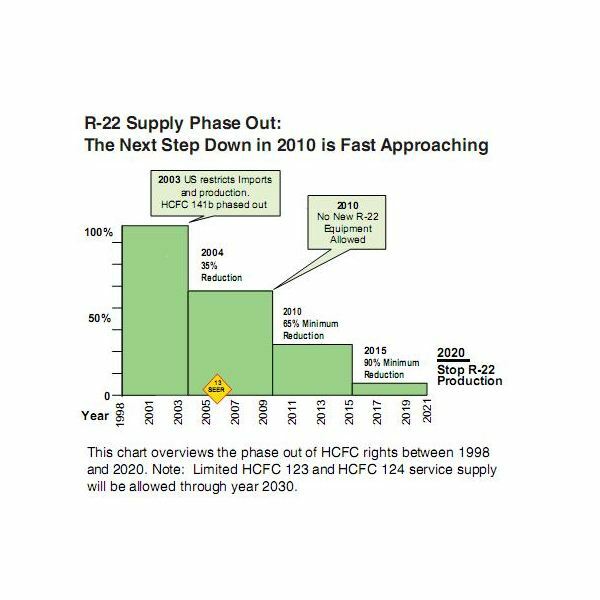 Though the efficiency of the DX plants is higher, the air handling units and the refrigerant piping cannot be kept at very long distance since there will be lots of drop in pressure of the refrigerant along the way and there will also be cooling losses. Further, for the long piping, large amounts of refrigerant will be needed which makes the system very expensive and also prone to the ma instance problems like the leakage of the refrigerant. 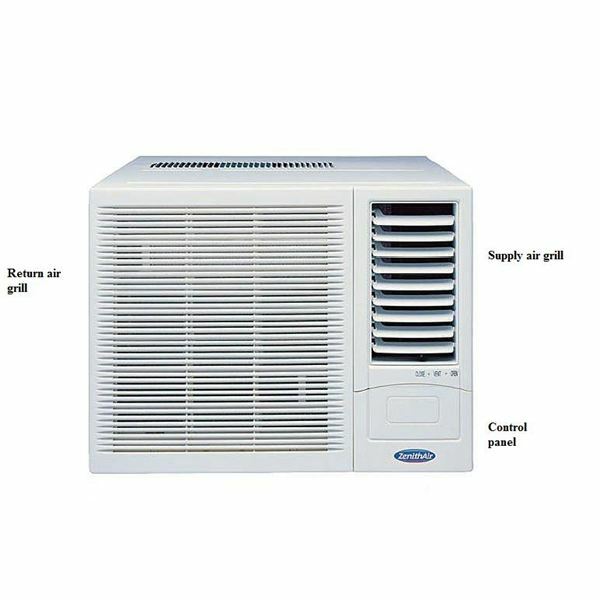 Due to these reasons the DX type central air conditioning systems are used for small air conditioning systems of about 5 to 15 tons in small buildings or the number of rooms on a single floor. If there are large air conditioning loads, then multiple direct expansion systems can be installed. In such cases, when there is lesser heat load one of the plants can be shut down and the other can run at full load. The DX expansion system runs more efficiently at higher loads. Even in case of the breakdown of the plants, the other plants can be used for the cooling purpose. 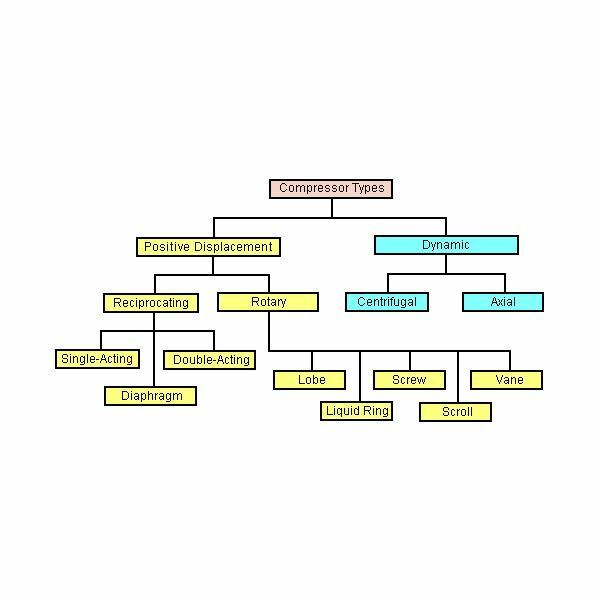 The DX types of central air conditioning plants are less popular than the chilled water type of central conditioning plants. 1) Basic Refrigeration and Air-conditioning by P N Ananthanarayanan, Tata McGraw-Hill Publishing Company Limited. There are two types of central air conditioning systems: Direct Expansion (DX) type of central air condition plants and Chilled Water type of the central air conditioning plants. 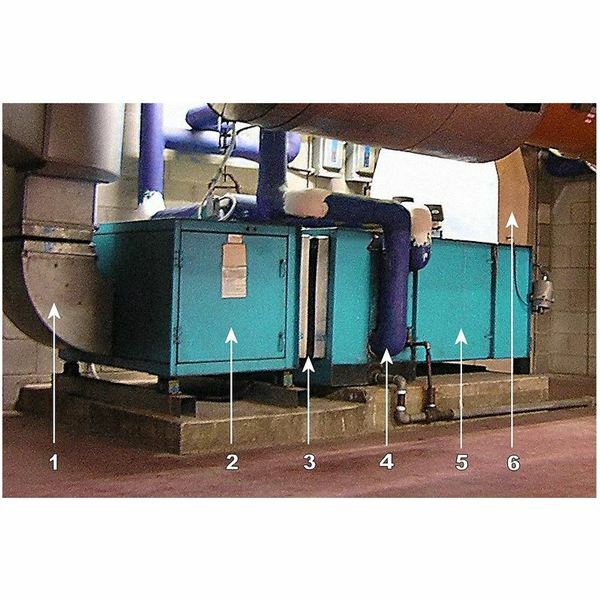 In this series of articles both these plants and air handling units have been described.